It’s quite hot in Mombasa and it seems the cold weather had disappeared early. The rains have disappeared. 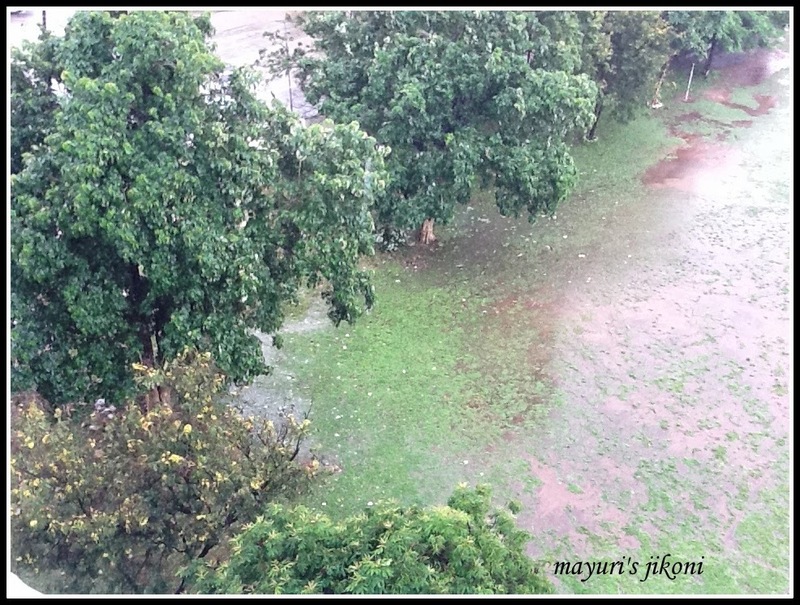 It rained a lot two weeks back and the Loreto Convent School ground, just next to our building got filled with huge puddles of water. A light drizzle didn’t affect the children. It was fun watching them play in the rain. Little kids love to jump in the puddle oblivious of the consequences… wet shoes, socks, clothes. Its the gleeful laughter that is music to the ears. The trees all around appear lush green, the sea is all grey with a curtain of mist over it. I remember how we use to play in the rain during the monsoon. Our school, Sophia, Mt Abu was at the top of a steep slope. During the monsoon, rivulets would run down towards the main gate. We would stand in these rivulets, till a nun would appear and reprimand us for not being in the classrooms. A few years ago, I experienced the Mumbai monsoons for the first time and I hated the whole experience. Constant rain, smelly clothes, dirty puddles, was really not my scene. After staying there for 2 weeks and ran away to Bangalore. I really don’t like getting wet in the rain, I hate when speeding cars splash you with dirty water. Roads are full of potholes, puddles cover open manholes, rubbish emit an awful smell. What a contrast…. looking out of the window makes the rains appear romantic, clean, refreshing but on the ground level its a different story altogether. However, rains are necessary for life so we balance the good and bad. Wash the samo in water 3 to 4 times. Put the samo and water in a pan. Let it cook over medium flame for 5 minutes. Stir frequently so that the samo does not stick to the bottom of the pan. It should appear like a very thick paste. Boil, peel and mash potatoes. Add the cooked samo to it. Grease you hands.Take a tablespoonful of the mixture and roll it into a ball. Flatten it a bit to look like small patti. Roll the patti in the flour. Repeat steps 7 and 8 with the remaining mixture. Heat oil in a frying pan over medium heat. It should not be smoking hot. Fry the pattis till they appear golden brown. 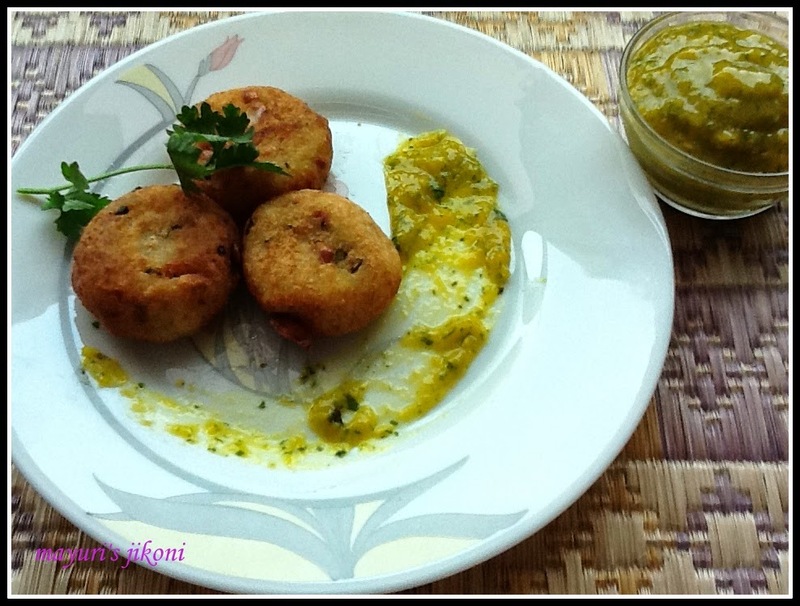 Serve hot pattis with chutney. Put the mango pieces, chilli and mint in a processor. Process into a coarse paste. Remove the chutney into a serving bowl. Add salt, cumin powder and ginger and mix well. Use cashew nuts instead of peanuts. If you do not roll the pattis in the flour, it will stick to the pan while frying. Make sure the samo is not watery. 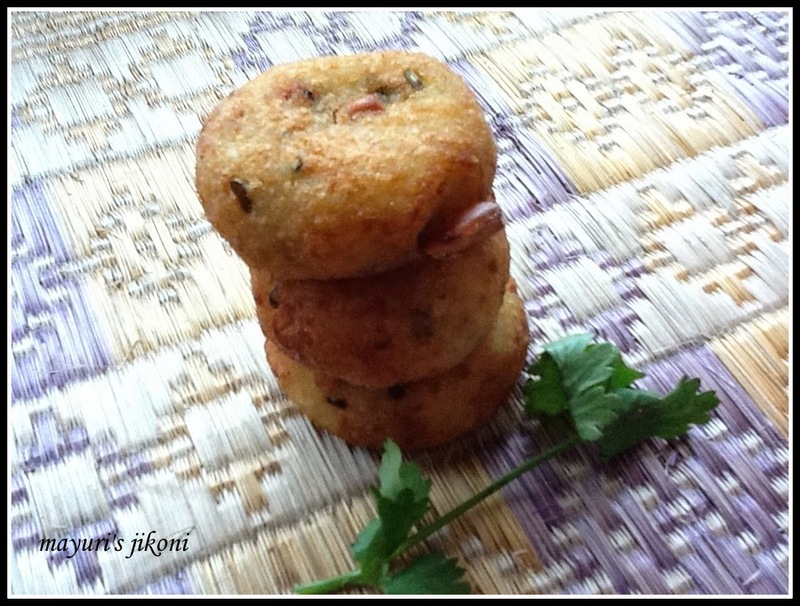 I can faraali recipes without fasting and this one is easy to make and perfect with a cup of tea enjoying rains. Thanks for linking it to only gluten free.